How many quarts of milk and cream does the average American consume annually? What is the average span of life of the average American woman? How many piano tuners are there in the United States? How long does it take a rhinoceros to run one hundred yards? Find out those answers and more when the contestants reach the Grand Slam question. 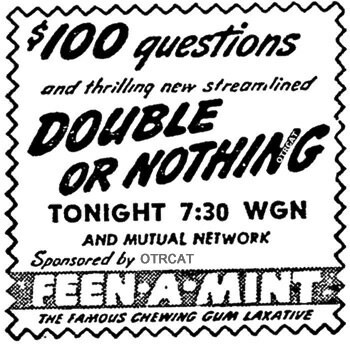 Feenamint the chewing gum laxative originally sponsored Double or Nothing. Hosted by numerous people including John Reed King and Walter O'Keefe, music performed by Nat Brusiloff and His Orchestra, Alois Havrilla served as the announcer. Jesse Lasky, Lili Damata, and even Vice Admiral Thomas Craven made guest appearances. There is some speculation of the authenticity of this game show, as many of the contestant's answers have been called "canned." That may be true because the last sponsor of the show was Campbell's Soup. During an episode sponsored by Campbell's Soup, a contestant is given a bite of Campbell's Pork and Beans and says, "I don't like it!" Be the first to comment on "Double or Nothing"